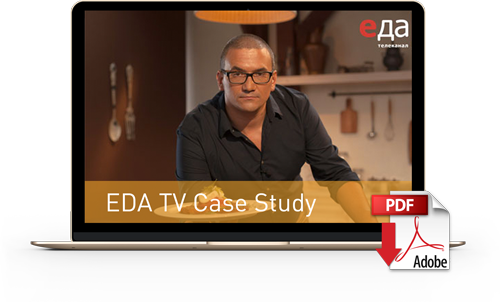 Eda TV is a cooking thematic channel launched in 2012 that broadcasts nationwide to all Russia with great success of audience. It is part of the production company Pi-Stolet and it is based in Saint Petersburg (production and validation center) and Moscow (broadcast and playout). In this regard, Eda TV needed a system to coordinate both centers, where the studios and playout system were located separately, in order to broadcast content to all Russia more efficciently. Moreover, this integration had to be agile and intuitive for users, since they have to manage a great number of media assets and prepare them for broadcasting in record time. Thanks to VSN’s system, Eda TV has been capable of increasing the productivity of its employees. The automated workflows that allow to complete the most repetitive and heavy tasks without the users’ intervention, helps them focus on continuos improvement of content and audience engagement to ensure the success of the channel. It allows to have under control the whole media life cycle, from the very beginning of the production tasks in Saint Petersburg to the playout and broadcasting in Moscow in record time. The customised workflows allow automatic content sending, while the UMP acceleration protocol helps it being delivered up to 20 times faster than any FTP with advanced security and encryption features.